Hello, hola, and namaste! We're Chris and Amita. We admire the profound love and strength that led you to look into adoption. We look forward to welcoming a second child into our lives, and we are so grateful that you are considering us for this lifelong journey with your child! You will always have a place in our family in whatever way feels right to you. It's Always a Good Day for a Baseball Game! 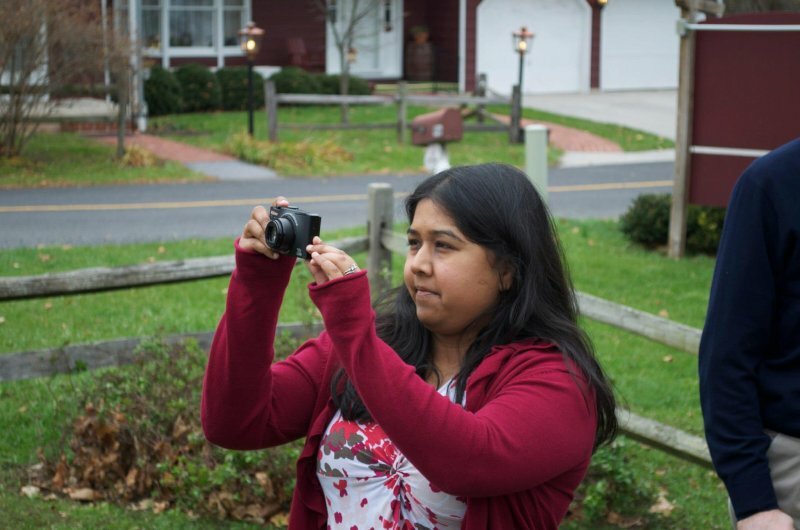 Amita is passionate about photography, going to the movies, and trying new restaurants. Chris loves writing poetry and short stories, cooking, and drawing, and he volunteers sometimes with a community organization that provides social services for local families. We both also like working in the backyard garden together. All three of us love to read and to travel, and we try to go someplace new every year to explore a little bit more of the world. We can't wait to find out what our second child loves to do! One of the summer activities that we can't wait to share with our future child is our love for Washington Nationals baseball. We try to see three or four games a season and we always have a great time cheering on our local team. Amita About Chris: The thing I love most about Chris, is his immense ability to care about the wellbeing of others. He's a wonderful, caring, devoted father - one that has no problem being silly, dancing to Disney tunes and singing our daughter the most beautiful songs to bed. He is a loyal friend, family member and neighbor, that will stop whatever he's doing, to help someone in need. He strives to be the best he can be in both his personal life and career and I absolutely adore this about him. He truly wants to make the world a better place and does whatever he can to accomplish this. Chris About Amita: Ever since I first met Amita, I knew she had a gentle soul (that's why I fell in love with her!) She's a wonderful woman -- smart, generous, loving, and kind. There is a beautiful picture of her holding our niece on the day she was born, and Amita's face is just pure, glowing happiness. Nothing could have made her happier in that moment than to be holding that baby! I see the same look on her face so often when we're with Anjali and our nieces and nephews. Amita was truly born with a loving heart, and there's no greater joy than being with her when she shows it. Our family is already culturally diverse! 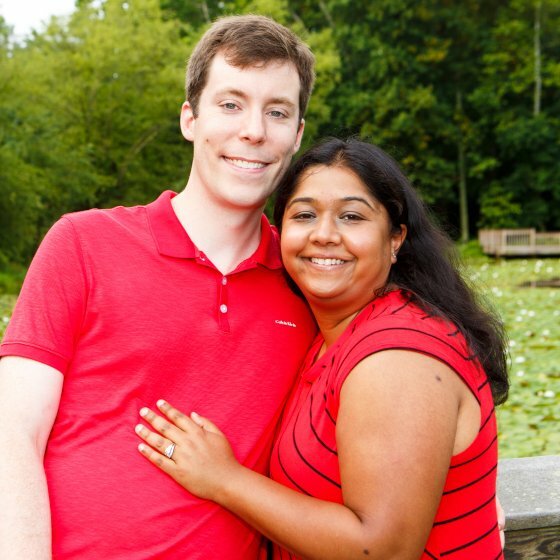 It's important for us to celebrate and honor the cultures that both Chris and Amita were raised in. 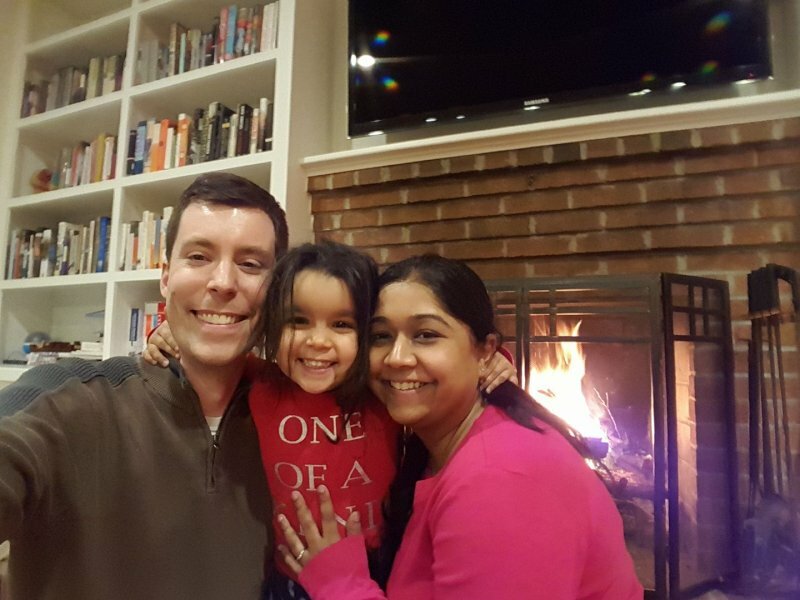 We observe American traditions like Thanksgiving and Christmas with both Chris' and Amita's sides of the family. Indian holidays like Brothers' Day (Bhaibeech) and Sisters' Day (Rakshabandhan) are also part of our family tradition. We celebrate these special Indian customs by having dinner with Amita's family. 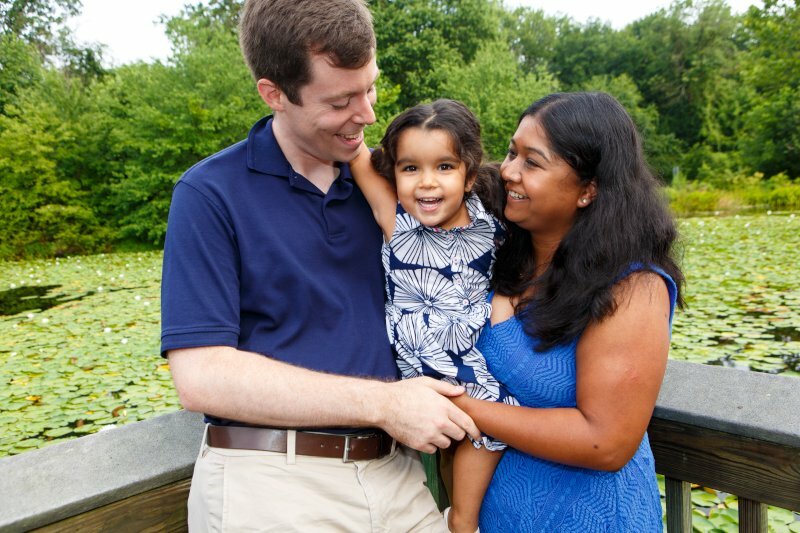 It's important to Amita and Chris to respect both the American and Indian traditions our family is built on, especially because our daughter, Anjali, is biracial. If we adopt a child from another cultural background, it will be just as important to all of us to add that culture to our family story and make it a part of our family traditions. We live in a very diverse neighborhood, and there are local cultural and civic groups for people from all around the world. Plus, Chris will teach our kids to speak Spanish no matter what, but it will be even more important to us if we adopt a Latino child. We've lived in the Northern Virginia suburbs for just over ten years. We have a single-family home with five bedrooms. Our daughter and her brother or sister would each have their own room and a large playroom to share, with plenty of space to build a pillow fort or take a ride in the rocketship tent. Our favorite room is our kitchen, which looks out into the living room. We spend most of our time here making and eating dinner, watching movies, having impromptu dance parties and cozying up next to the fireplace in the winter. Whenever friends and family are in town, this is where we break out the snacks and have a visit! Being so close to Washington lets us visit all kinds of different museums, the National Zoo, and the National Aquarium (we love the sea turtles!). In the summer our town has concerts every Friday night and an annual carnival, all a short walk from our house in the town square. One of our favorite places to visit in our town is the local playground. It has swing sets and a few big jungle gyms, and we can almost always watch the local baseball and soccer leagues playing here. We come here often in the summer, since it's on our way home from work and school. On the weekends, we love to visit the local farmers' markets and other nearby parks, especially the local kid-friendly water park. Our family includes more than a dozen aunts and uncles (and so many cousins!) who are all excited to welcome a new member of the family. Amita's brother lives just a few minutes away, so we get to see him and his family often. Chris's parents and Amita's mother live in Pennsylvania, and we visit them about once a month. We both have large extended families, and once a year, Amita's side of the family gets together for an outing at the beach or another fun spot. We want our children to grow up knowing and loving their grandparents, so spending time with them is a high priority for us. We also love to spend evenings with our friends by hosting board game nights at our house and going to monthly book club meetings at our favorite local pizza shop. Our family is very diverse. We have relatives from all over the world, so our family is very supportive and understanding of a transracial adoption (our family is transracial already, after all). We also have several family members and friends who were adopted, including Chris' stepmom and her sister, so we know how close and how beautiful the families built through adoption can be. Everyone is very supportive of our adoption plan, and we're all excited to welcome this child into our family! We want to give you our deepest thanks for considering us as you make this important decision. We hope to provide a nurturing home and a loving family where this child will grow up cherished and supported in all that he or she does. Our commitment to raise our children to live happy lives while being a force for good in their community is steady and strong. We have been a couple for over fifteen years now. We became friends and fell in love in high school, and we will celebrate our ninth wedding anniversary in 2018. The loving marriage we are blessed with grew out of a close friendship that is still the bedrock of our life together. We have grown so much over the years, and we're very lucky to have shared our lives for so long. We have learned a great deal from each other and know we can count on other through thick and thin. When we were younger, we thought medical issues would keep us from conceiving children. We've always known we wanted to be parents, so we have talked about adoption from the very beginning of our relationship. Many years later, when we found out we would be able to conceive and our daughter was born, we had some of the happiest moments of our lives. 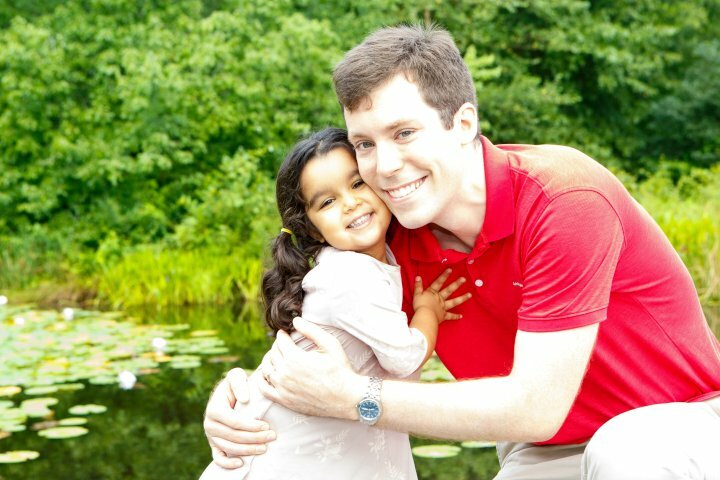 Of course we are thrilled that Anjali came to us, but we still believe strongly in adoption, and after so many years of making plans we still want to bring a second child into our family through adoption. We have several friends and relatives who are adopted themselves, and we know how wonderful a family built through adoption can be. Knowing these adoptive families has helped us to decide this is something we want for our own family, too. We value and enjoy our careers, but family has always been our number one priority. We grew up with parents who worked very long hours to provide for our families, and we are immensely grateful for the sacrifices they made. This upbringing taught us the serious responsibility of providing for our family's needs, but it also taught us that those needs aren't only material. We think it is so important for children and their parents to spend quality time together and build full, rewarding relationships with each other, and that is what we try to do with our family every day. If you choose us to adopt this child, we hope he or she will have a loving, lifelong relationship with you starting from an early age. We would love to send you letters and photos as the child grows up, and we would like to stay in touch by phone or have in-person visits if you would be comfortable with this. Please know that you will always have a place in our family in whatever way feels right to you. We look forward to sharing all sorts of big milestones and little moments with you over the years. Thank you so much for giving us the chance to share our dreams with you. Getting a Dalmatian puppy as a Christmas surprise. Zack was the best dog ever. Summer visits to my cousins' houses. I would spend almost a month every summer visiting each of them. Middleswarth BBQ chips. The Pennsylvanians know what I'm talking about! First time taking my daughter to the zoo. Seeing her expression when seeing the lions and tigers was priceless! Our trip to Europe: London, Paris, Madrid and Barcelona. Exploring new cities we hadn't been to before was amazing. Matthew 25:40 "The King will reply, 'Truly I tell you, whatever you did for one of the least of these brothers and sisters of mine, you did for me.'"